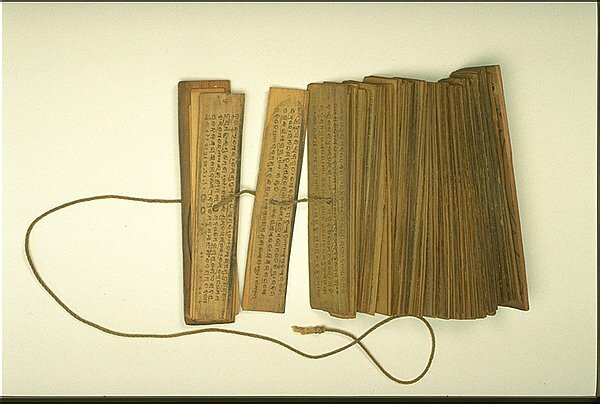 Tree leaves were used as a writing material in India and Southeast Asia to record Buddhist scriptures, law, biographical information, and Sanskrit literature. The leaves of the bai-lan tree (similar to palm leaves) were trimmed, flattened, and polished smooth with sand. Characters were scratched on the surface and colored in with a black, sooty pigment. To finish the book, holes were drilled in the leaves, and the stack was bound together on a cord or rod between wooden covers. Even after paper was introduced into Tibet, Tibetan paper manuscripts still retained the elongated, narrow look of the palm-leaf book.